Stakey's Pumpkin Farm is a family-owned and operated business that is nestled on the East End of Long Island in the scenic town of Aquebogue. Farmer Jim is a 3rd generation farmer, but the first of his family to have a "Pick Your Own" pumpkin farm. Our pumpkin farm acreage started in 1976 with just over an acre and has grown into a spacious 26-acre field, where you can roam and pick from 18 varieties of pumpkins straight off the vine! 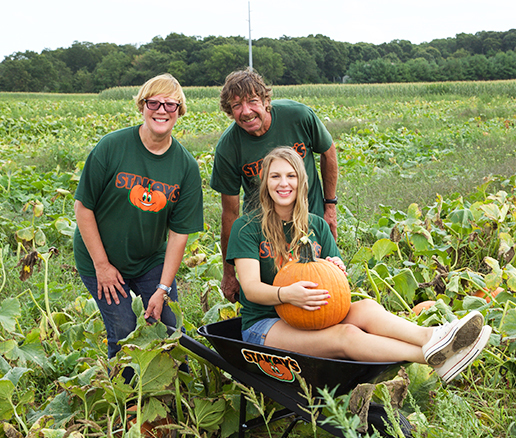 Our mission at Stakey's Pumpkin Farm is to keep our farmland authentic and developer-free so that future generations may continue to enjoy pumpkin picking as much as we enjoy offering it to you. We also grow and offer hardy garden mums, flowering cabbage and kale, fresh cut cornstalks, bright straw bales and so much more. We are pet-friendly! Stakey's always welcomes friendly, leashed pets!